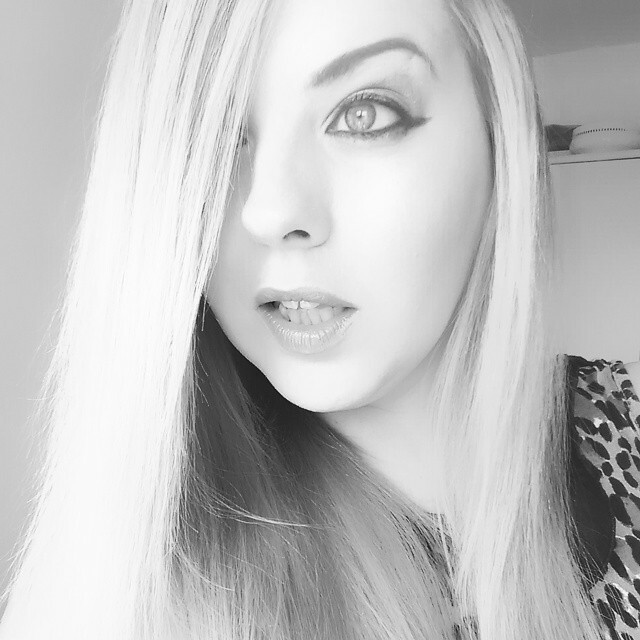 There is one thing I love about having long blonde hair and that is when it plays nice it looks amazingly shiny and healthy. Unfortunately this pregnancy has not been kind in the later part of my pregnancy to my hair and it looks very dull and lifeless . One of the hair products that I have been trying this past month has been from a very trusted hair brand and I have to say that I am rather impressed with its whole idea and packaging as well as the most important thing, the results! 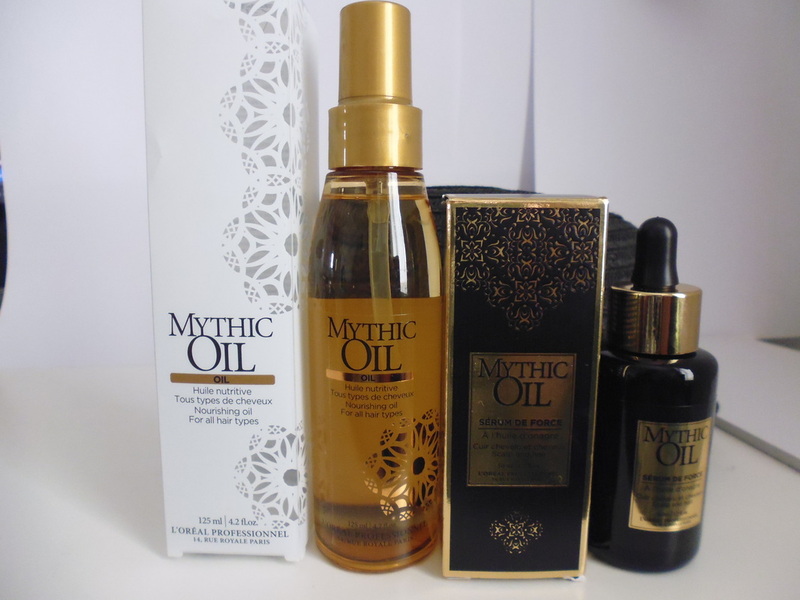 Mythic Oil By L'Oreal Professionnel. I was sent two of their products and my thoughts on them are purely of my own and not what has been pushed onto me by anyone else who supplies or produces them. This is best used on damp hair . 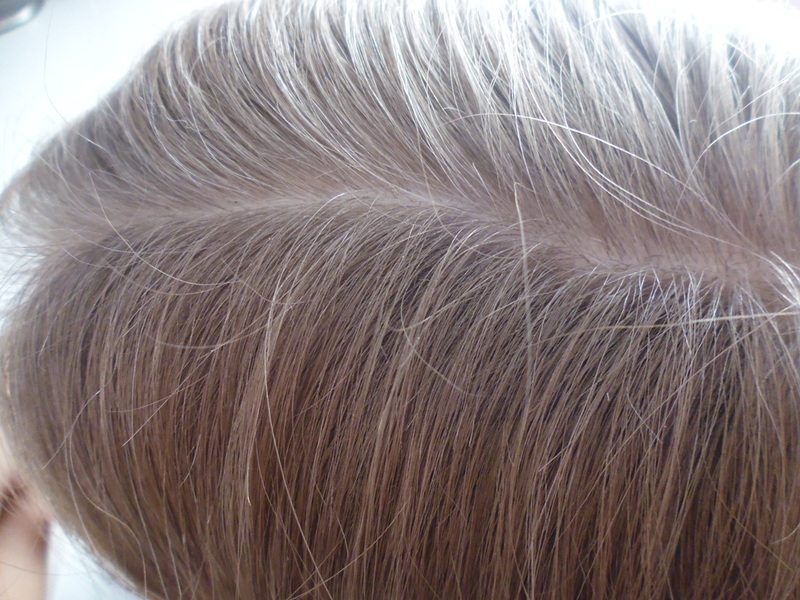 Apply 2-4 drops of the serum onto the scalp and gently massage using your finger tips. For starters , I love the very professional packaging . Black and gold is an amazing colour co-ordination that sits lovely on my vanity table and with this packaging being made of glass , it can easily be cleaned out afterwards and reused if I wished. The cost is a little pricey for my liking but this will last a good length of time as you only need a very small amount . The first thing I notice regarding the product is the scent and wow I love it. It stays on the hair throughout the day too which makes it all the more appealing to me and that delicate floral scent is just delightful , really you need to smell it to understand how amazing this aroma is. 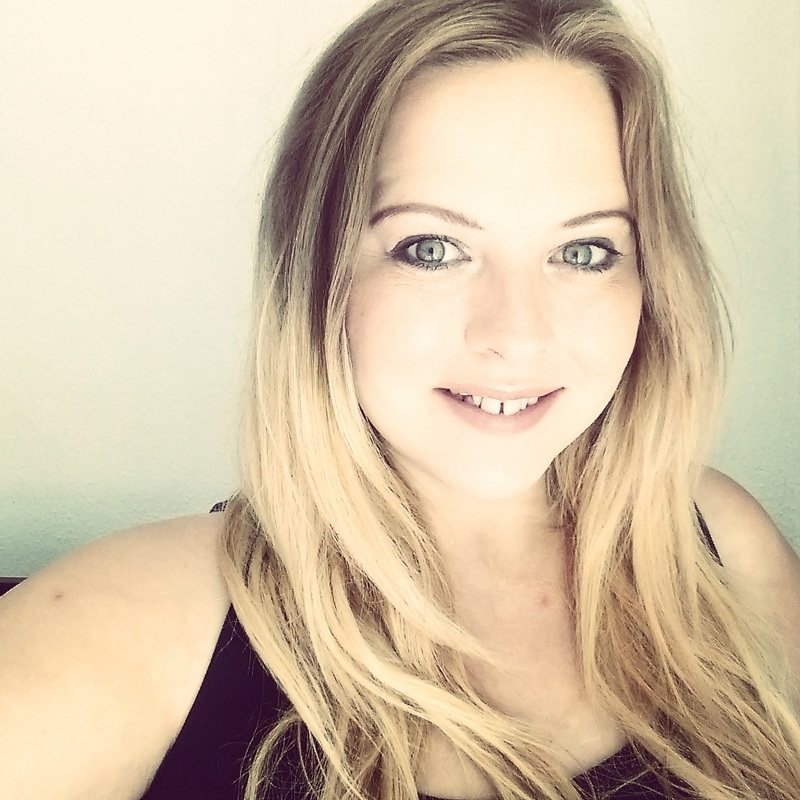 I have incredibly thick , course hair which can be a pain for looking after as I battle daily with dryness, friz and managability and so oils become very much a need for me to help tame the issues. I also tend to use heat tongs and curlers too and so I find oils a great protection from heat and this has been something that I have loved about this product most. 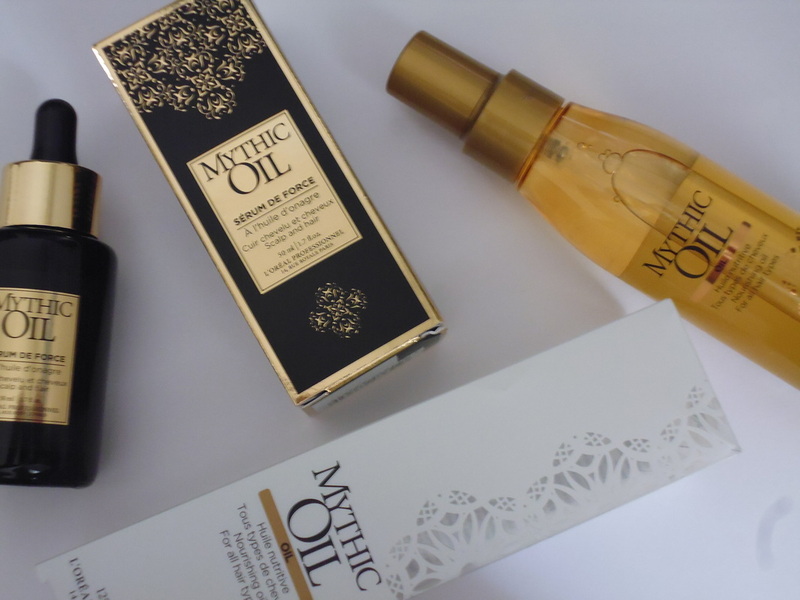 My scalp feels protected, nourished and moistured and I feel the irritation I would normally get from over styled hair is eased when I use this Mythic oil. I am not usually a fan of primrose but this ingredient helps this product which in return helps your hair to be protected against breakages. After using this for only one week , I could feel the difference . My hair feels and looks so much more healthier and it feels absolutely amazing to the touch. I think the scent is so addictive and if I could own a bottle of the aroma , I would as it so luxurious. Apply to dry or damp hair by using around 2-4 pumps depending on thickness and length of hair and work through all of the hair. 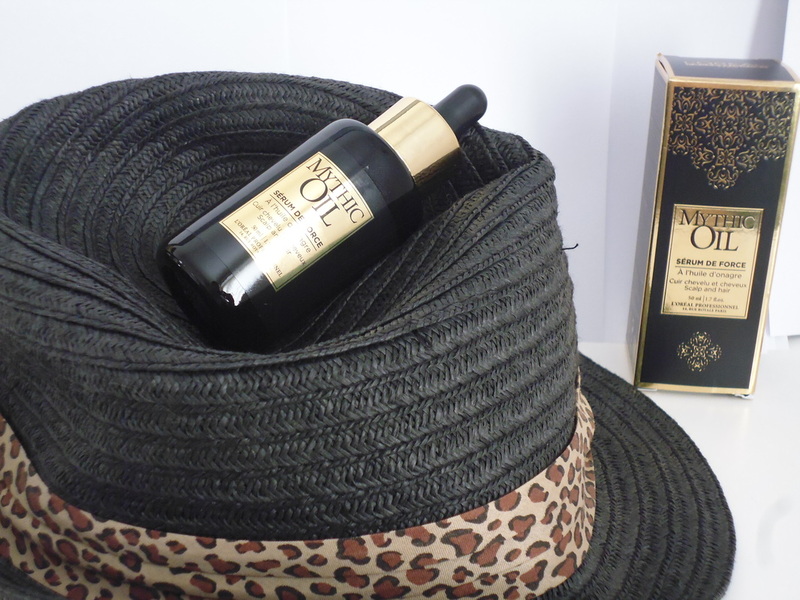 This is perfect for all hair types which is fantastic as most oils usually work best for thin hair which I most certainly do not have. 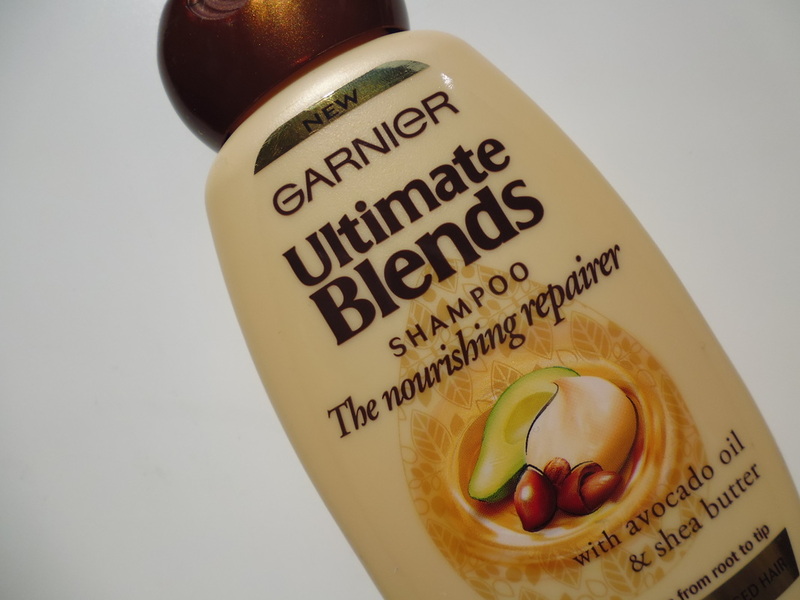 I love that it has that blend of avocado oil and grape seed and helps my dry and dull hair looks healthier instantly . Usually oils can leave a greasy look and weigh down my already heavy hair , this however does not, it is so light weight that I can barely feel it there at all and it leaves my hair feeling amazingly soft . The aroma is just like the serum, floral and delicate but I have found that the scent does not last as long as the serum does which is a shame really. It also is a little more delicate and less distinctive . I have to agree that the Moroccan oil has been my most loved oil as of late and I have been pleasantly surprised to find this is also heavenly . Using it with my every wash has given my hair that all new lease of life and revitalising look. My hair feels amazing and looks amazing and I no longer feel the pregnancy has taken over control of my locks . 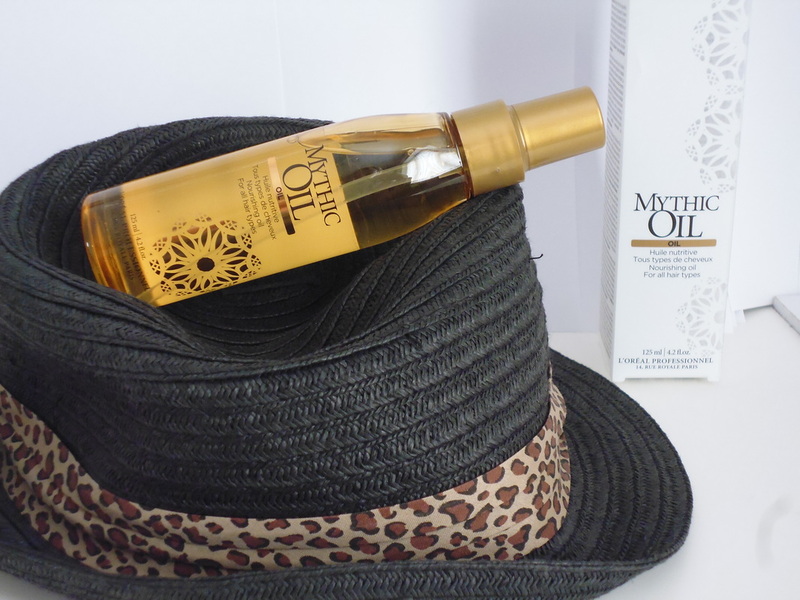 The great thing about this oil is that it leaves no oily or greasy residue on your hands therefore neither on your hair which gives it that gorgeous shiny and healthy look while not making it look greasy. For my long , thick hair I only need two pumps of this and my hair has enough so it is definitely lasting me a good length of time therefore making it worth the money . I am in love with this product , it has kept its place right at the front of my everyday use product supply on my vanity table and I would totally recommend this to anyone who has hair lacking in healthy shine and bounce. It certainly brought back the life in my hair. So I seen it on the adverts and in the magazines but how did the Color WOW really fare up against headlines? Color wow seems to have hit both magazines and t.v screens pretty quickly considering it has not been around that long and to me I never thought something so small could go from zero to hero in what I would say months from me hearing about it although in reality it has been around a lot longer than I thought and already it has been given awards from Pure Beauty Awards, Harper's Bazaar, Glamour beauty and Woman and home as well as many more over the past couple of years. Color WOW Root Cover Up is also QVC’s Beauty Pick of the Month for August this year. So what is Color WOW Root Cover Up ? Basically , Color WOW Root Cover Up is a new innovation to help those who colour their hair when their roots start to come through. Maybe you have a last minute date and you have no time to get to the salon or simply have no wish to colour your hair to cover those dreaded roots with even more chemicals and spend more money for a small cm or two of grey hair or natural hair showing . 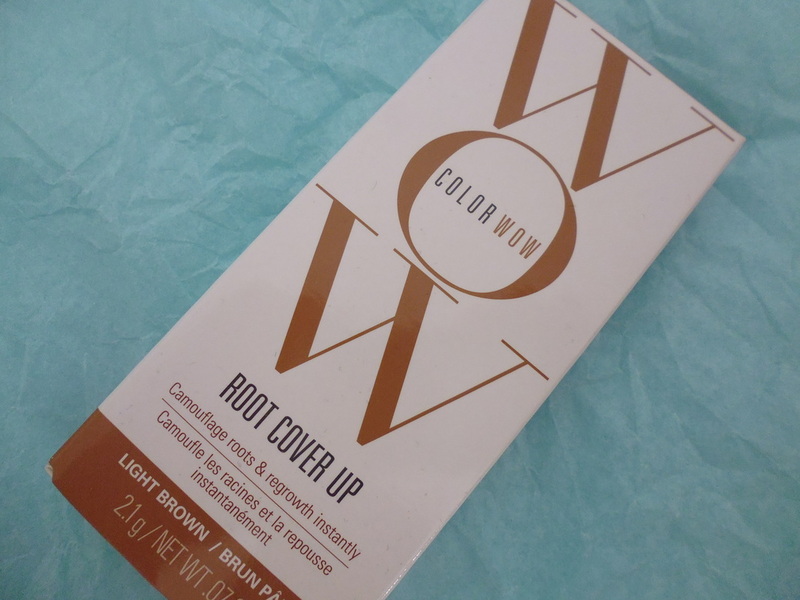 Color WOW Root Cover Up is a fast and quick effective way to do the covering up in seconds . This root cover up will cost around £28 depending on the store you choose to buy it from and comes in one compact little case that fits perfectly in your bag to be taken with you where ever if needed. 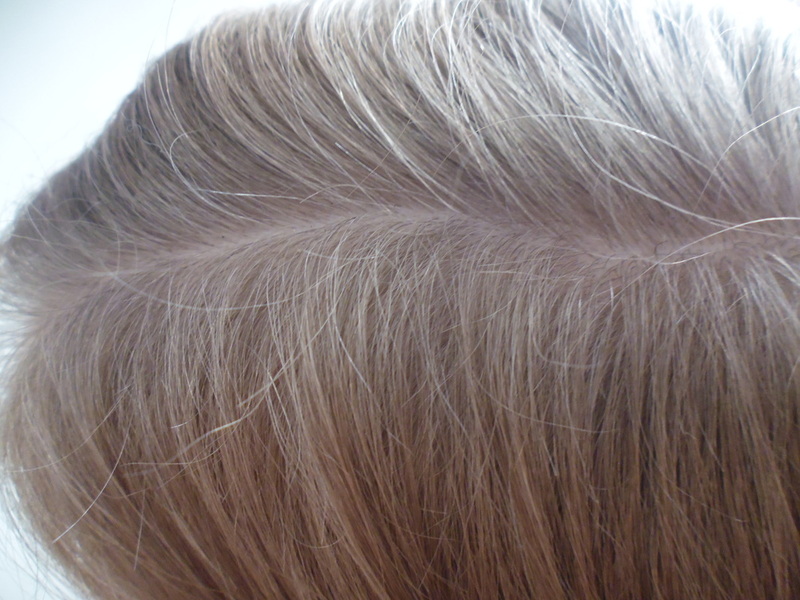 I do not seem to have roots needing covering up but as en example of the shade on the hair, you can see the colour is not much in difference. 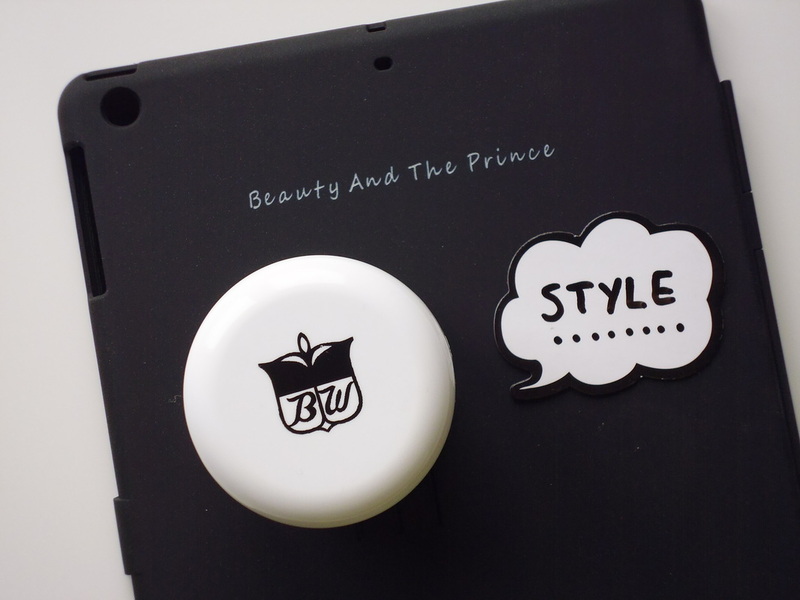 The little compact is a black hard plastic casing with a small brand marking on the front . The case opens up and has that fantastic clicking sound helping you know it will be closed and secure in your bag with no fear of the product being damaged . 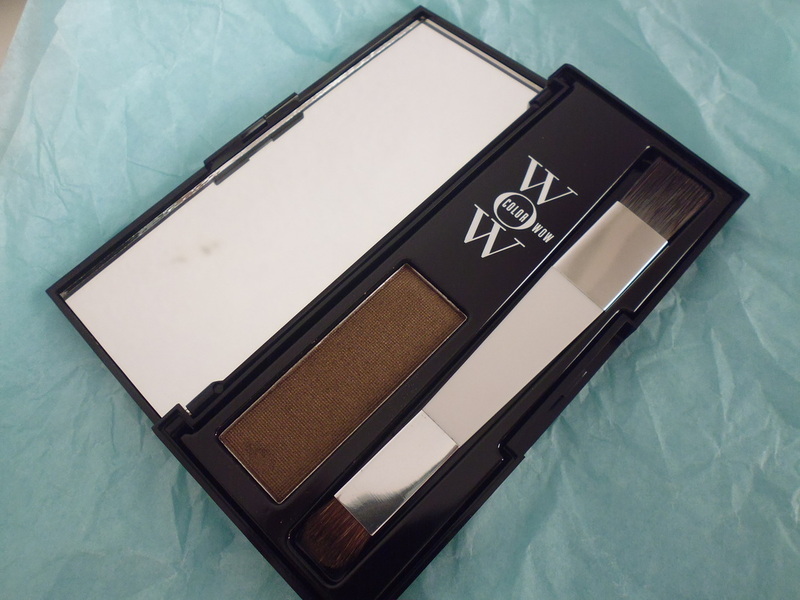 Inside the case , is a mirror attached on the lid to help you see along with a two sided brush and of course the product itself. 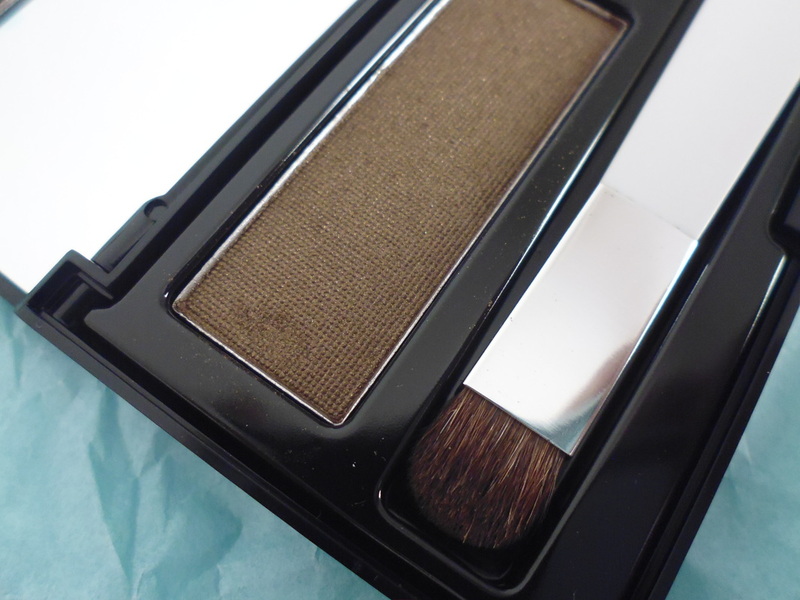 The brush is quite small and is 11cm in length making it ideal for using for accuracy. It has two separate sides , one for the smaller areas and then a larger one for the full coverage which may be needed for the larger areas. The brush is very soft and picks up the product well although I find the more you apply , the more fallout and waste you get. The product itself is a mineral powder and is applied to the hair dry . I am not sure if this is something I would be needing any time soon as I do not colour my hair but if your the type of person who loves to constantly have a colour added and find those roots come through way to often that its pinching at the purse strings too often, then this is certainly going to save you spending more money at the salon as often as you need to. The mineral powder sticks to the hairs individual folicals and is easily removed with a simply shampoo but I think I would be a little sick of having to add it every single day I need to go out and being a powder it washes of in the rain so it is no good for the colder or winter days , well in fact any British season as it always rains here. The price also seems a little steep to me although I can see how it would save people some cash if they need to hold of for a few more weeks to go to the salon but is it really worth it? This time I have not been so impressed. Great idea but not much different to finding a similar shade in my eye shadow palette and using that instead at a smaller price. Sorry Color WOW , I do however love your hair styling products though. So my hair is starting to get really greasy and looking unclean as soon as I wash it in this pregnancy and it has really started to annoy me . I don't have the energy to be washing it every night and when I do it makes my hair even worse to handle. 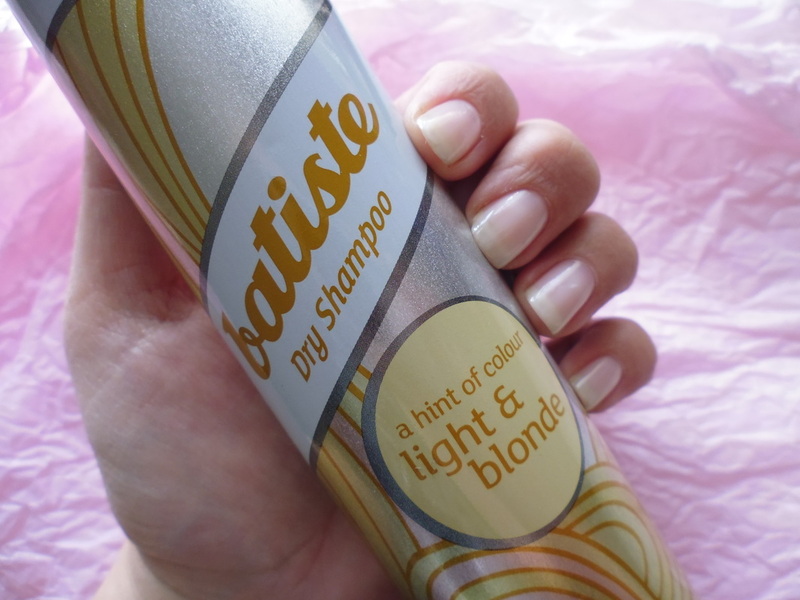 Luckily I have found a bottle of Batiste Light & Blonde hidden in one of my boxes I had from moving home which I bought when I bought the Batiste cherry which smelt amazing and saved my hair during the months of moving home a couple of months ago. I simply forgot about my box of items and to be fare, shocked at how many new items are in that box but what an excuse for a pamper when you feel you need one. Batiste has a always been a name I think of immediately when it comes to the dry shampoo chats and when someone came into the nursery and we stood chatting about how much of a hurry she was and the fact she had to use some talk to soak up the grease in her hair, I simply remembered I had a bottle or two of Batiste hidden away and needed to rake them out. 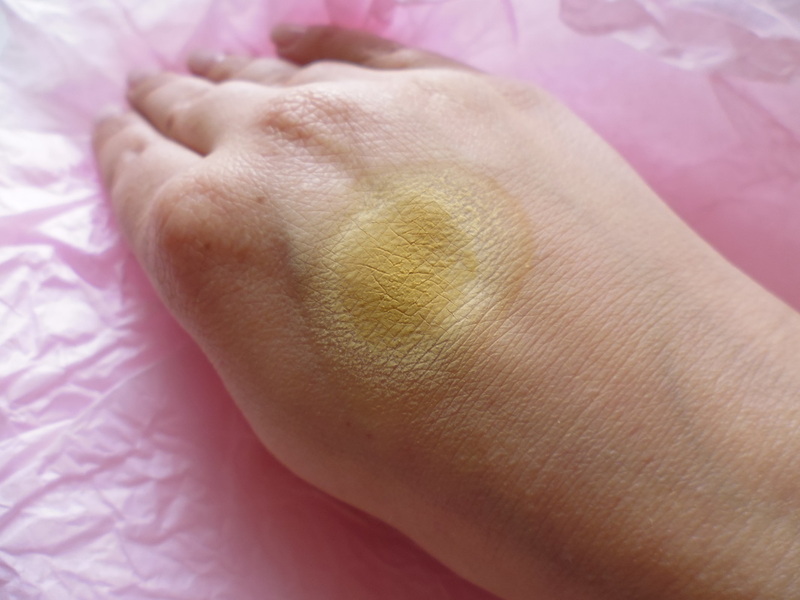 On the canister , it claims that it is a dry shampoo with a hint of colour and when I sprayed it gently onto my skin to see how much colour is transferred , I found that the shade was of a yellow or blonde tone and as it dried it became lighter and almost white. The instant feeling about this was that the pressure of the can seems very high and when I spray this onto my hair I seem to be spraying way to much which seems a lot of waste to me. I can not seem to slow the amount that is coming from the tin and I am ending up with a lot on making my hair look a little powdery and dry . Give the product its dues, my hair feels amazingly soft and silky and looks a lot brighter but there is no natural shine which I tend to like on my hair , it looks rather dull. Using this product is really simple, I simply spray from about 20cm away from the hair onto the whole of my hair then brush or work through with my fingers. You need to be careful of the colour of the spray transferring from your hair onto the collars of your clothing though, although it does not stain it can look like you have talk on your shoulders as it wipes or falls from the follicles . I think this is a product that will come in handy for those holidays like camping which I used the Cherry one for for a quick refresh or for me I will find it handy in my maternity bag when the time comes but especially for the upcoming summer days when my head sweats so much more than usual . 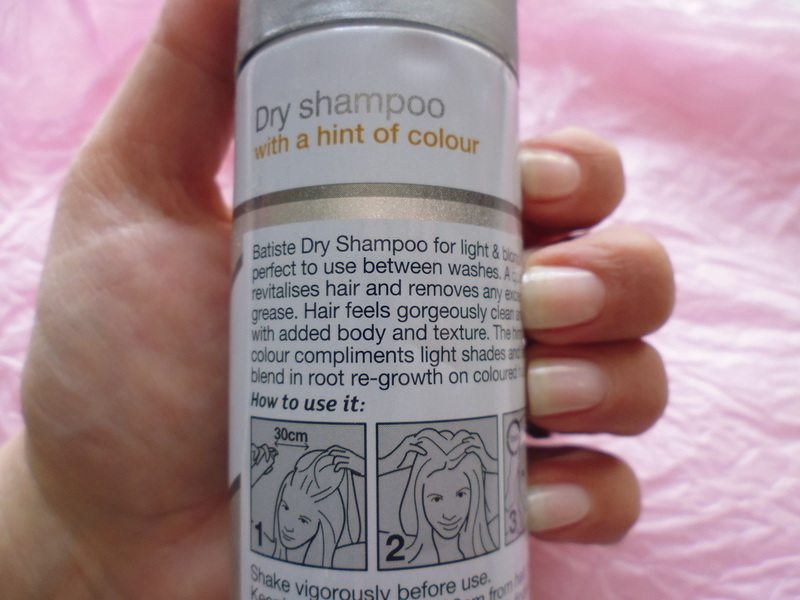 What do you think about Dry shampoo , is it worth it , have you tried an alternative like talc or is it simply just lazy? You can grab a can of this Batiste from most leading stores from around £2-£4 but I keep an eye out on the Poundshop shelves to save a few bob. 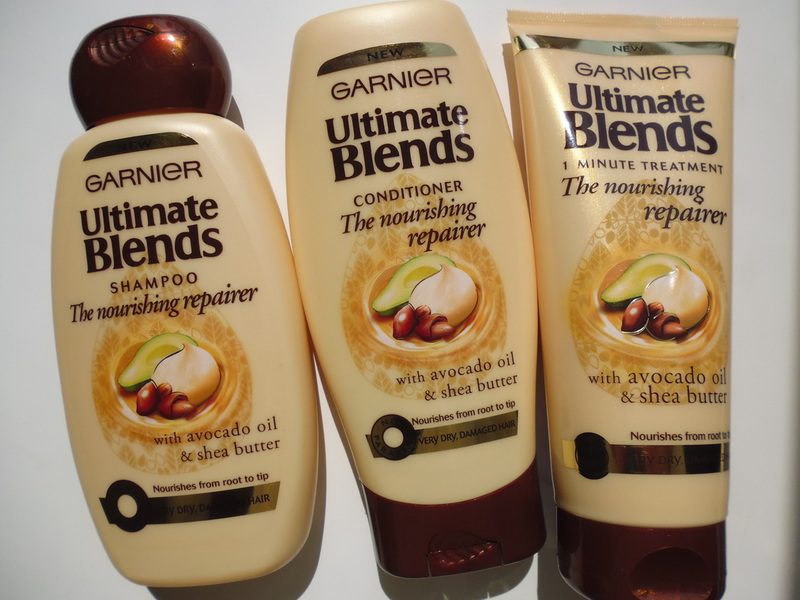 I have to be honest in saying that I have never been truly loyal to one particular hair brand when it comes to shampoos or conditioners and although I do have my favourites, some of them seem a little pricey for my small budget so it is rare I go back to the same one unless its on offer or an affordable price. 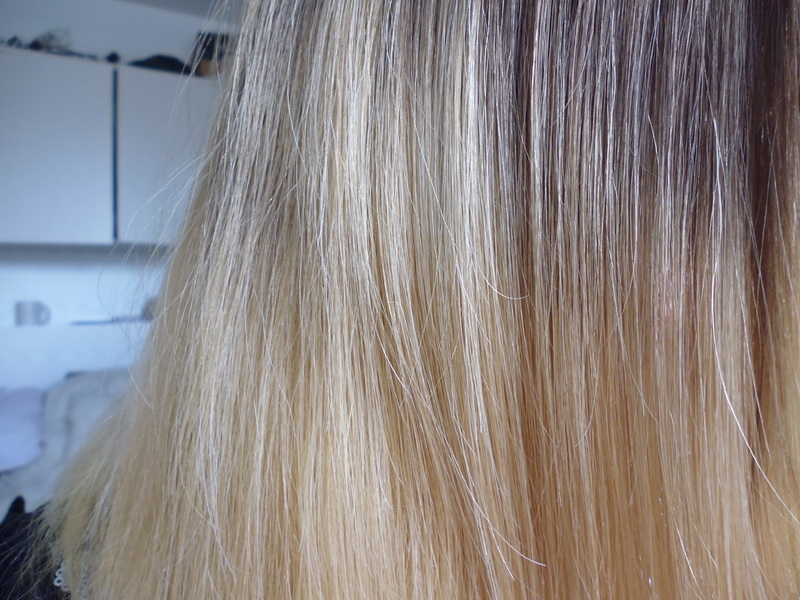 I want my blonde hair to become brighter with the natural highlights relifted without the use of hair colourants . I want my hair to feel and look conditioned, shiny and healthy with a gorgeous bounce . 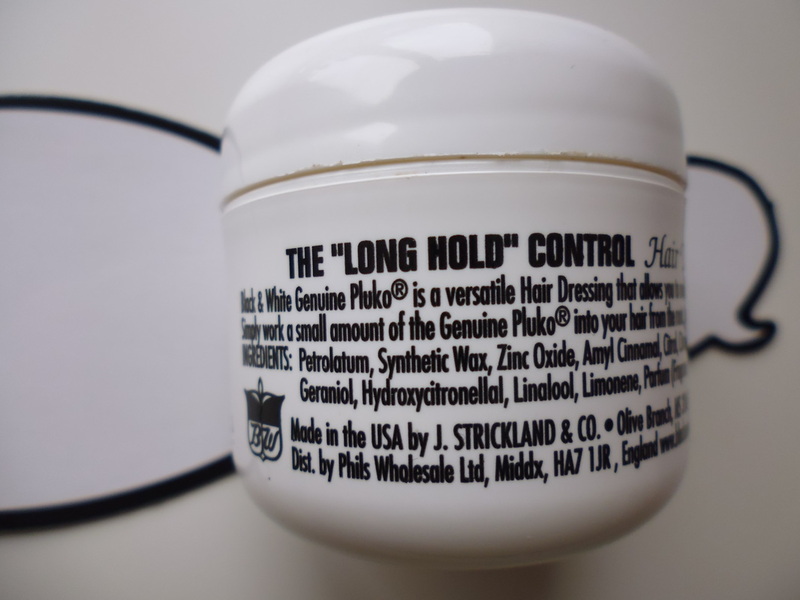 Frizz and split end control is something I can not help with very thick hair like mine so I need protection and repair from the causes and means of this happening . I want to use one or two products not a drawer full of 10 bottles and tubes, its costly and space consuming. I don't think this is a long list to ask for from a hair product and I know through experience that usually I have had to use sometimes up to 6 different products to get a that look which is passable but with all those ingredients now on the hair , left feeling a little heavy and over applied with too many ingredients. The Sleek Restorer - This works best for those who suffer with dry and Frizzy hair and is blended with that silky Coconut oil and Cocoa butter. 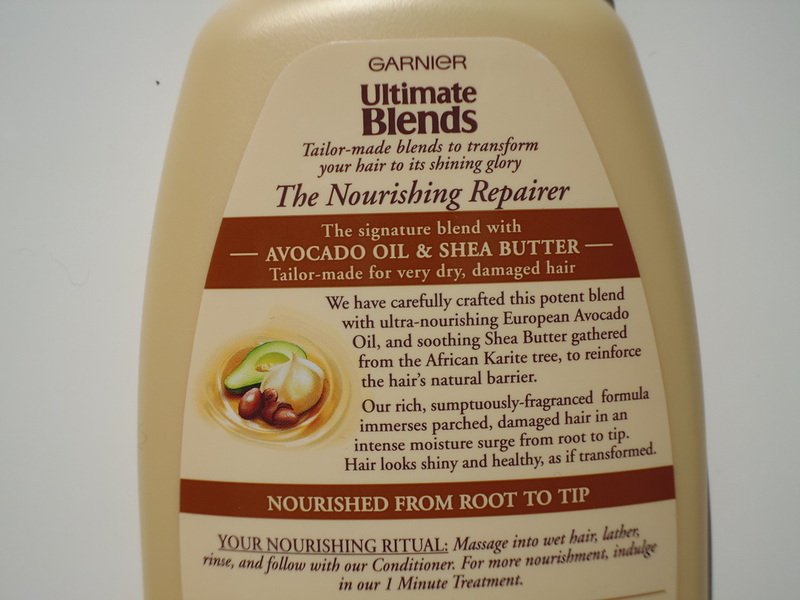 The Nourishing Repairer - This blend of Avocado and Shea butter works to nourish those dry and damaged hairs . The Silky Smoother - For those who suffer with split ends and mid to long hair , this Papaya and Vanilla milk will leave your hair feeling revitalised . The Colour Illuminator - Coloured hair needs special attention too so this blend of Argon Oil and Cranberry will ensure it stays nourished and will illuminate shine. The Marvellous Transformer - Is your hair feeling and looking a little lifeless , then look no further than this blend of Argon and Camellia oils. The Shine Revitaliser - For those lucky enough to have normal hair you can use this blend of lemon and green tea to keep that hair bursting with life . The Strength Restorer - To help with damaged hair , the heavenly blend of Honey, Propolis and Royal Jelly is perfect. The area I wanted to try was the dry and damaged issues which the Nourishing repairer and its blend of Avocado and shea butter worked perfectly with. Shampoo is usually the product I have the biggest problem with, I tend to find that some products dry our the hair too much and I end up having to use half a bottle of the conditioner to balance it out. This shampoo however left the natural oils on my hair whilst at the same time cleansing it and leaving it feel clean . Having very thick and long hair , I tend to need a lot of conditioner as my hair gets very dry and tangles easily even whilst washing . 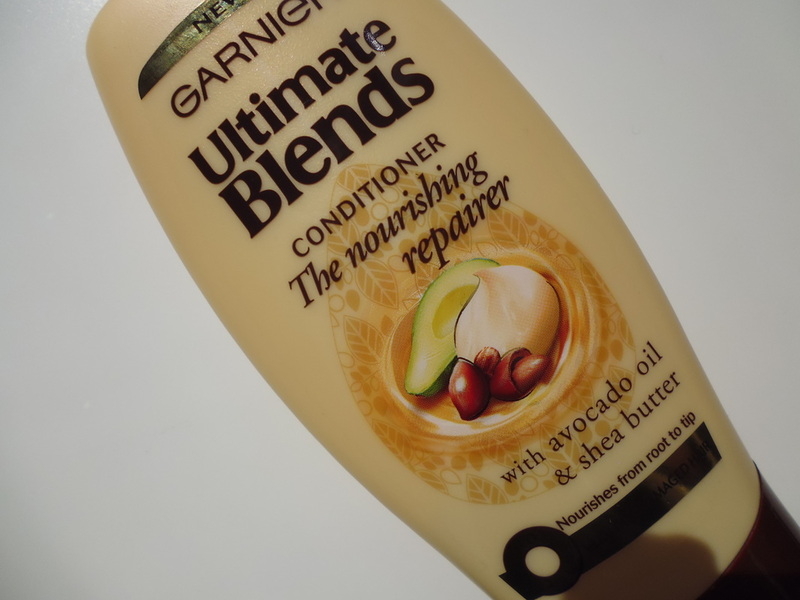 This conditioner did exactly what it said it would, it left my hair feeling soft and silky, I could run my fingers through it with only one or two tangles instead of ten and I adored how healthy it left my hair looking. Just as the name suggests, you only need 1 minute to use this which is perfect for us mums on the go, travellers or simply anyone who is in a hurry . The consistency of this product is very thick, certainly like a mask and very creamy like. I find this leaves my hair very soft and silky , perfect when I have no time for a full on pamper and need a quick shower to spruce my hair . 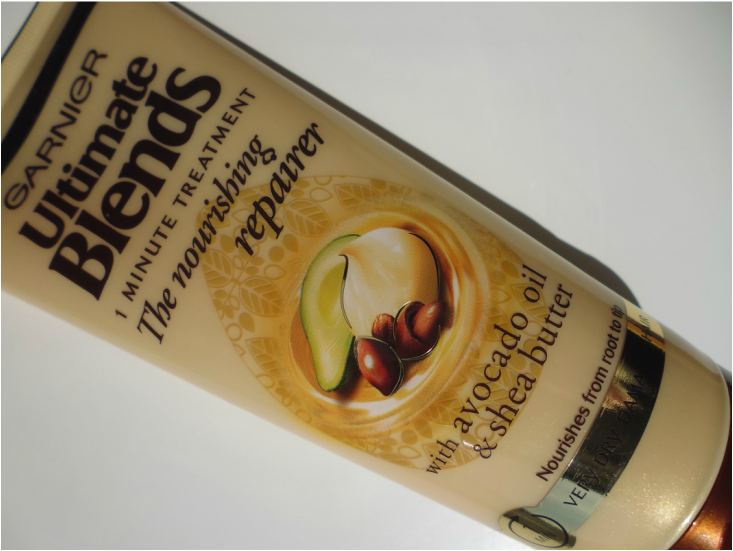 My overall thoughts on this range is that the Avocado and Shea Butter , Nourishing repairer line was a perfect add on to my daily hair care regime. The packaging, I have to admit has not got the most luxurious of looks, I actually hate that yellowish tone on products although I do think they tried to go with a blonde or golden theme but the bottles themselves were a great size and manageability of using them in running water was easily done. The one thing that settled on my mind about it though mostly was not only was my hair amazingly soft , but I had a gorgeous scent of Shea butter whisping around the air , it was a gorgeous aroma and I found myself giving my hair a sniff every so often . The only downside to this product I found was that I could not keep my hands of my hair, the soft and silky feeling kept having me touch it which became almost addictive. Out of my 4 needs I found this covered 2 of them , I only needed to use 1 product to get a healthy conditioned feel and look but the frizz was still there whilst my highlights were not brought out as well as I have had with other products . What new hair product have you been trying lately, let me know so I know to give them a try also . I have always had an issue with styling my very long , thick hair and recently discovered that I actually suit curls more than I do having my usual straight hair . 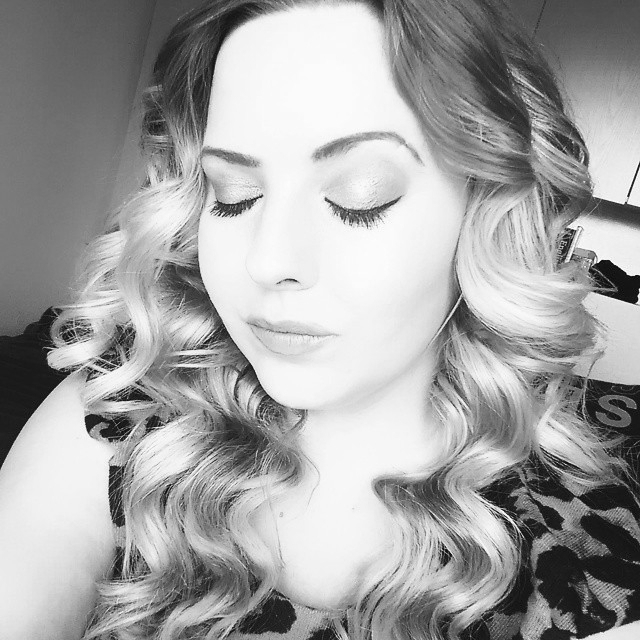 The worry for me though is that when I do style my hair I tend to get a heavy weight and still a frizzy finish and with using heated curlers to get that perfect curl, it often leaves my hair looking less dull than it had when I had washed it , taking away that gorgeous healthy looking shine. I have always used a shine spray for my finish to help with this issue but it can be costly and I simply have not got the pounds at the moment with being pregnant as every penny is needed. I remember reading a fellow bloggers post regarding this product and although he was a male blogger it still appealed to me as my hair is very course so I usually find men's hair styling products work best for my hair when it comes to gels, mousse and wax. I have actually been using this for around three weeks now and I did post a picture on Instagram of my curls and the finish was fantastic and I for one was very impressed . I love how adorable and handy the small tub is but a larger tub is available and you can pick these up from various leading stores . Black & White is a versatile styling wax that allows you to mould, sculp and create texture. Black & White Hair Pomade adds shine and is great for taming thick hair, styling choppy bobs or mohawks, and gives a long-lasting hold. It seems this product is suitable for both male and female and with its gorgeous coconut scent it makes it even more delightful to have in your hair as the scent lasts all day long , I have even found myself opening up the tub just to have a whiff for those days I am not wearing it . 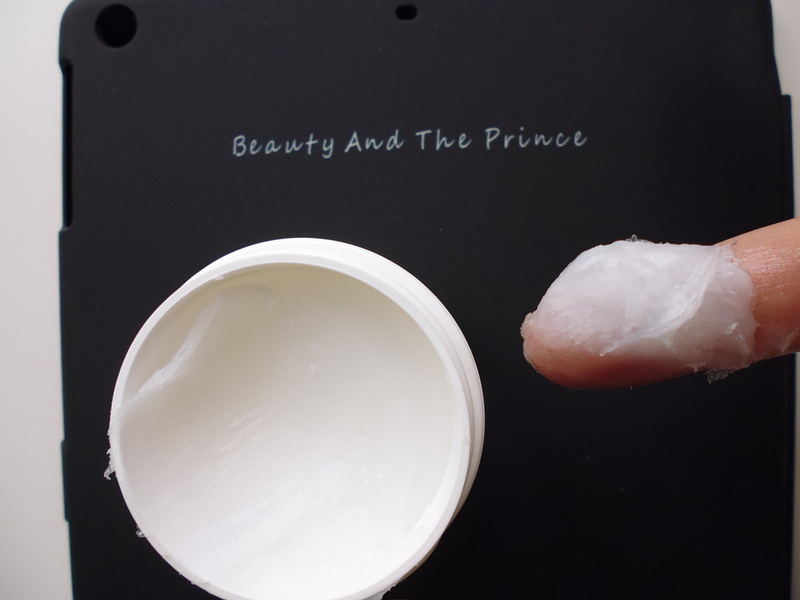 When I first took a look at the texture of this I found it looked very hard and Vaseline like but on digging in the finger to take some from the tub it seemed to warm to my hand and to be fare I was rather scared that this was going to make my newly cleaned hair look very greasy . The reality was that it actually blended very well into my hair and in fact added the moisture my dry hair needed without making it look overly shiny and not at all greasy. I found it made application easier by slightly spritzing my hair with water to leave it slightly damp , I found it hard to work through when applied to dry hair . Although I have very long, thick hair I only needed a small amount, about the size of a 10 pence piece which was enough to get through my full length. He is the finish to my curls . I also used this on my straight look. I have tried everything to get that iron straight hair and even my straighteners could not manage it . I achieved the following look by adding a small amount to my hair after towel drying , then styling straight from washing . It was the first time I can remember that I got a flat straight look . I found that wearing this product in my hair left my curls and straight hair looking styled all day. The product was pliable and gave a fantastic hold to both styles and the one thing other than keeping the frizz and look together I was most impressed with was how it gave my hair that healthy looking shine . What hair styling product are you using at the moment (if any) ?